Although my son is on 13 months now he'll be drawing before I know it. I was inspired to write this post when I saw the images above featured on Decor 8, a few weeks ago. 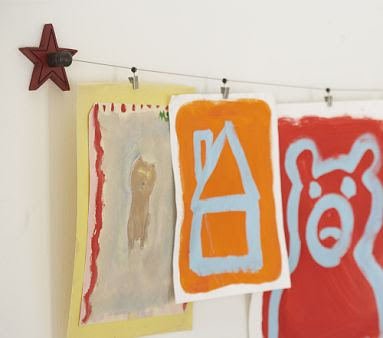 I don't think I've seen a classier or more imaginative way to display your children's artwork. 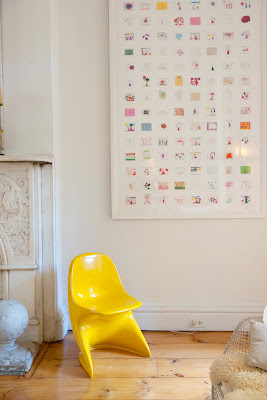 This mini collage was designed by Jan Elini for her home in New York City. The collage measures 60" x 40" and holds 112 designs. 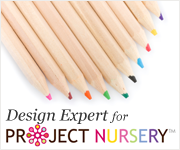 They are custom designed and can be ordered through her website Jan Elini Interiors. 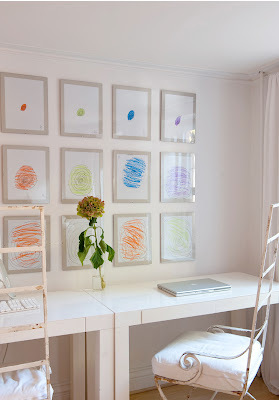 Another photo featured was of her desk and yet another grouping of her children's drawings. This is a more do-it-yourself approach with frameless glass. These are simple glass plate frames which can be purchased at most frame stores or even Target & Walmart. This is a simple but effective multi-color gallery-style frame combination from Aaron Brothers of their colored metal frames. An inexpensive and easy solution. For a less modern look, try framing the artwork in spray-painted gold frames similar to the ones above. Both images above and below are via interior designer Caitlin Creer. In this living room she had the children of the house paint family portraits to display as art. What a great idea! I have always liked this image from Cookie Magazine of a home in Pasadena. Instead of making one large cork wall in the living room, they separated it by painted white panels to make it look more architecturally interesting while creating a special play space for the kids. Dynamic Frames offers a nice gallery-like alternative with their 4-piece Da Vinci interchangable art collection. 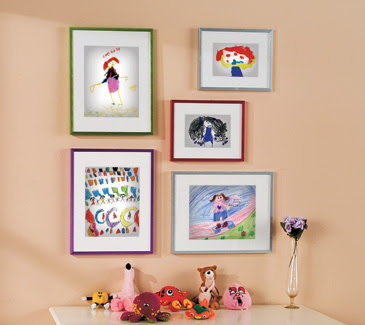 The frames not only display your children's artwork but also store 50 pieces and can be hung vertically or horizontally. If you are looking for another solution without using frames or putting too many holes in your walls, try covering your walls with burlap or grasscloth (the texture of the wallpaper hides the holes from tacks). 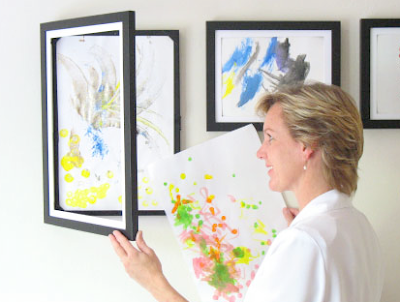 For those tech-savy moms, you can create your own poster of your child's artwork by scanning it and uploading the images to Snapfish or Shutterfly and creating your own collage poster or canvas image of the artwork. 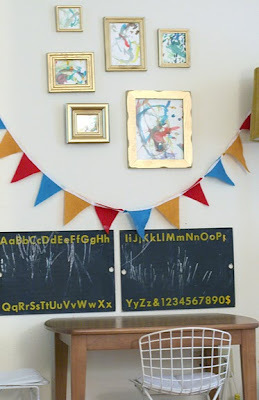 The Art Cable from Pottery Barn Kids pictured above is an inexpensive non-committal option for hanging artwork. The cable clips enable you to change out the displayed artwork more frequently plus there is no danger of a sharp tack getting stepped on or swallowed by a little one. My last DIY alternative is to paint a wall with magnetic paint and then cover it with the color of your choice. MagnaMagic Active Wall primer is an inexpensive solution and costs as little as $1 a square foot. 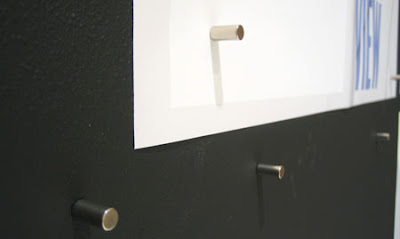 You also don't have to use magnetic paint on the whole wall, just chose a section where you would like to hang the artwork. Magic Wall Magnetic Paint is another good magnetic paint source. If you really want to be creative, use magnetic paint first and then cover with chalkboard paint, that way your kids can either hang their art on the wall with magnets or create new art with chalk whenever they want. I would love to have some of my old childhood artwork hanging in my house, wonder if my mom kept it...time to raid the attic when I go home to Texas next month for a visit. Nice post. At a recent home trade show I got some awesome ideas for display art work. Thank you for your ideas.